Woo hoo! Another week is done and over with. Although I love my work, it's nice to hit Friday and be ready to relax. Do you have any big plans this weekend? 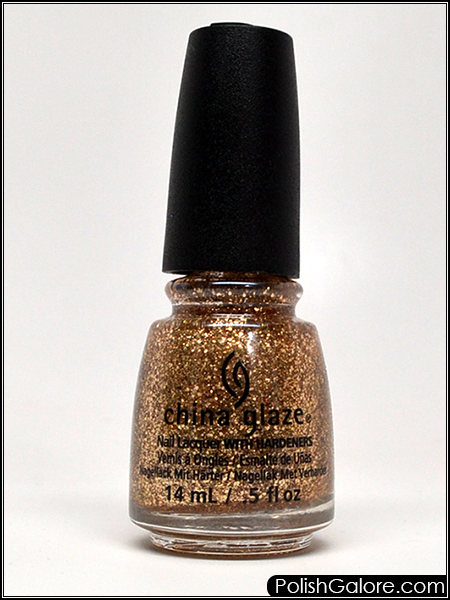 I decided to grab China Glaze Big Hair & Bubbly which is a gold glitter. There are different sizes ranging from micro to medium. 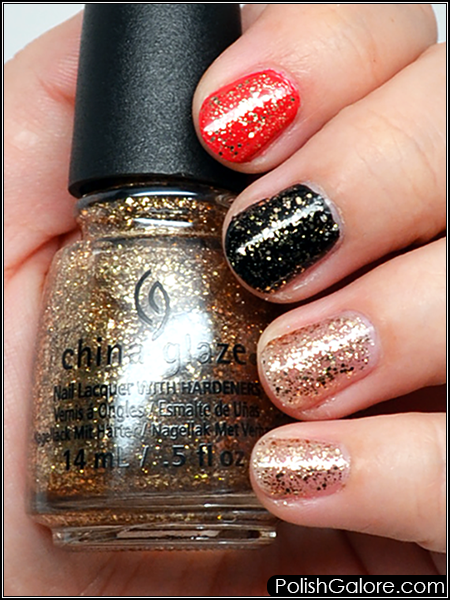 I'm glad that there isn't any large or odd shaped glitter because those are hard for me to wear on my curved nails. I started with Glisten & Glow Ridge Filling base coat, and two coats of polish on its own, sealing it with Glisten & Glow top coat. I realized quickly that this polish is a polish topper and not meant to be worn alone. Therefore on my middle finger, I used Cult Nails Fetish and 1 coat of Big Hair & Bubbly and on my index finger I used Morgan Taylor Don't Break My Corazon and 1 coat of Big Hair & Bubbly. I sealed both with Glisten & Glow top coat. As you can see, it's not a polish to wear alone unless you don't mind seeing your bare nail underneath. I know there are hacks out there on how to sponge on polish for full opacity but I don't love gold glitter enough to do that. I liked it well over black and it covered well... Red was kind of a crap shoot because I figured red and gold but I think maybe a light blue would have worked out better. Removal wasn't difficult. I've been using felt to remove my polish lately and it came off without any scrubbing or tearing of my nails.